As the video industry grows even bigger creating more impressive and elaborate environments, control for this industry with key standard protocols has never been so valuable. A robust and proven hardware, Mackie has been a standard in the Pro Audio industry for years. Without the need for drivers it is completely plug and play and with Mackie protocol being integrated in/compatible with Hippotizer, the Mackie controller provides entirely automatic mapping of Hippotizer controls with minimal setup time and a built-in display. 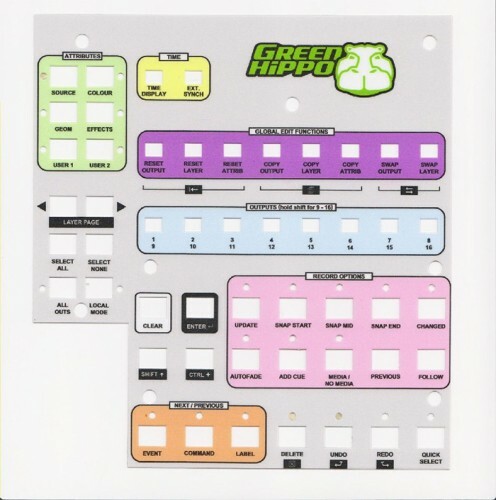 With this in mind, Green Hippo has designed a Hippotizer overlay for the Mackie MCU controller, giving you ease of use when working with Hippotizer media servers. The hardware provides motorised faders making navigation between layers and observing changes during Timeline playback easy. Mackie also features high accuracy level fades (greater than standard MIDI control change values) with three additional MIDI ports on the device for connecting additional controllers or other MIDI gear (which can be used with the MIDI2 component). The Mackie controller software provides a hardware interface for programming timelines and the quick programming of cue-based timelines. Timed parameter fades can automatically be inserted when recording cues and can easily be customised to provide quick access to commonly used parameters for any eventuality. Large networks of Hippotizer can be controlled using a single hardware device and the colour-coded overlay allows for quicker and easier programming by providing a visually easy-to-navigate control panel. This makes it feel like a custom hardware interface for Hippotizer at the cost of an existing device. Features such as the Jog-wheel and transport buttons allow easy navigation through timelines based on labels and cues. 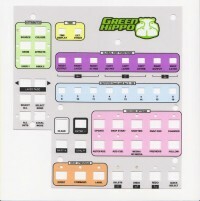 The Mackie overlay from Green Hippo is available for purchase now. Please contact sales@green-hippo.com for prices and availability.